These are some of the red lines revealed in the special volume on salinization in water ecosystems, published this December in the prestigious journal Philosophical Transactions of the Royal Society B, and edited by the experts Miguel Cañedo-Argüelles, member of the research group Freshwater Ecology, Hydrology and Management (FEHM-UB) and the Water Research Institute of the University of Barcelona (IdRA), Ben Kefford (University of Canberra, Australia), and Ralf B. Schäfer (University of Koblenz and Landau, Germany). Other participating FEHM-UB researchers are Núria Bonada (UB-IRBio), Cayetano Gutiérrez-Cánobas, Raúl Acosta and Pau Fortuño; Neus Otero and Albert Soler, from the Research Group on Applied Mineralogy and Environment (MAiMA) of the Faculty of Earth Sciences of the UB; David Suari and Santiago Gorostiza (UAB), as well as experts from the Environmental Hydraulics Institute IHCantabria from the University of Cantabria, the University of Murcia, the University of Castilla-La Mancha and the Institute of Natural Products and Agrobiology (IPNA-CSIC) in Canary Islands, among others. Salinization is a serious environmental threat worldwide and one of the most extreme cases is found in Australian rivers. In some fluvial basins of the peninsula -Soldevilla torrent in Sallent, the plain of Ebro River, or the region of Murcia- some of the rivers’ salinity is three or four times higher than the sea’s. In the European continent, salinization related to human activity is more and more worrying but there is a lack of regulation guidelines. High salinization in fluvial systems creates a serious ecological, economic and global health impact, in some cases related to the concentration of carcinogens in the water environment or metals released by pipe corrosion. Apart from damaging the systemic values of natural ecosystems, salinization makes the purification of water more expensive. Salinization affects biodiversity and the functioning of water ecosystems directly “but we need a lot of base-line information on organisms, communities and ecosystems to predict their effects”, says Miguel Cañedo-Argüelles, postdoctoral researcher from the Department of Evolutionary Biology, Ecology and Environmental Sciences of the UB and also member of the University of Vic – Central University of Catalonia (UVic-UCC). “We can only create efficient models to predict and mitigate the salinization effects on water ecosystems once we have this base-line information”, he adds. The map of the rivers that are affected by salinization in Spain -a third of all current fluvial systems- will be wider, according to the new study which analyses the main causes of salinization and creates future predictions in the situation of climate change and the different uses of soil. Mining, agriculture and farming and regime changes in precipitations -which limit the dilution of salt in rivers-, are drawn as the main threats for the environmental health of rivers regarding salinization. Some organisms die due the effect of exposure to an aquatic environment with an overconcentration of salt. Experts study how the physiology of aquatic insects is altered in rivers with salinization, since they have to adapt their metabolism to regulate the internal osmotic pressure and adapt to the environmental conditions. This adaptation process has a high energy cost and can affect vital functions and cause organisms to collapse (even in salt-tolerant waters). The authors analyse whether other aquatic insect species -which are more used to high salinity- live in rivers with salinization because they do not tolerate rivers with a lower amount of salt or whether there are other reasons. Everything points out to the fact that these salt-tolerant species can perfectly tolerate waters with less salt but they colonize extreme habitats so as to avoid competitors and predators. According to the conclusions, the aquatic insects’ response to the environmental conditions varies depending on how the salinity gradient goes: in high-salinization rivers, population deprives and the amount of species declines, while in rivers with less salt the salt-tolerant organisms are replaced by freshwater species. The common landscape in gallery forests is also altered due the effects of salinization. Apart from salt concentration in the water environment, there is a lower activity leaf decomposition as a result of the decline of insect population which feed from it. Moreover, the conditions of palatability of gallery forest leaves -diluted salt is absorbed by trees- and this could affect the aquatic fauna. Moreover, fungus and bacteria seem to show mechanisms to maintain their physiological efficiency in rivers with high levels of salt. The new study reviews the effects that can modify the aquatic system response to salinization. “There are three fundamental factors to consider”, notes Miguel Cañedo Argüelles. “In particular, the synergy with other factors that can interact with salinization (temperature rise, pollution due metals, etc. ); water ionic decomposition -different ions have different toxicity- and biogeographic factors (rivers without salinization nearby that can serve as a source for colonizer organisms) and evolutionary factors (generation of population of salt-resistant organisms)”. The expansion of salt mines in Germany during the fifties had a severe impact on the ecology of rivers (in particular the Werra and Wipper). The new study reveals these episodes of extreme salinization in water ecosystems in Germany -reviewed in the scientific bibliography by Schulz and Cañedo-Argüelles- caused the massive death of fish populations and the outcropping of toxic algae, among other environmental impacts. Nowadays, some countries such as Australia and the United States have made some advances to regulate the level of salinization in rivers but the level of protection is not enough yet. 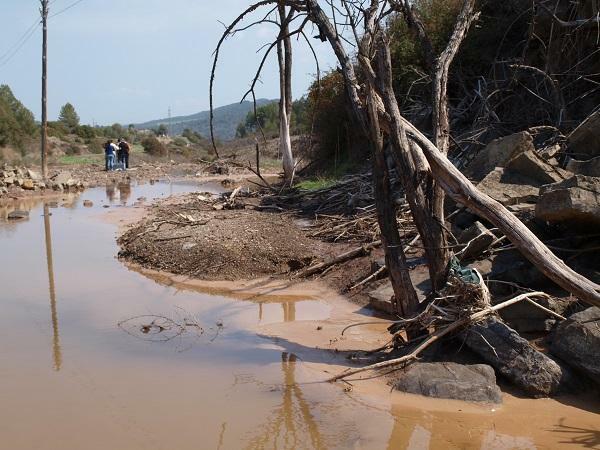 “It is clear that the current legislation on salinization in aquatic ecosystems is too lax and incomplete and we lack many efficient management measures” highlights Cañedo-Argüelles. “The most important and urgent management measure is to establish limit concentrations of ions in water to protect biodiversity and the health of water ecosystems”.